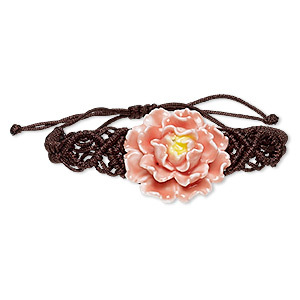 Bracelet, nylon and porcelain, brown / peach / yellow, 42x34mm-54x46mm flower, adjustable from 5-1/2 to 8 inches with macramé knot closure. Sold individually. Item Number: H20-7243JD Have a question about this item? 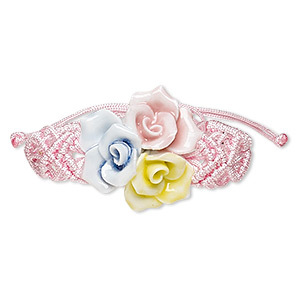 Ready-to-wear porcelain flower bracelet is ideal for gift-giving, counter sales or extending current jewelry lines. Colors, shapes and sizes may vary in each lot. 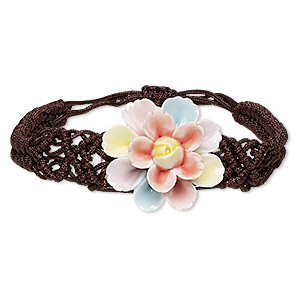 Bracelet, nylon and porcelain, multicolored, 42x34mm-54x46mm flower, adjustable from 5-1/2 to 7 inches with macramé knot closure. Sold individually. Bracelet, nylon and porcelain, pink / yellow / blue, 36x32mm-48x44mm flower, adjustable from 5-8 inches with macramé knot closure. Sold individually. 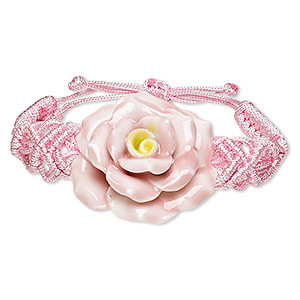 Bracelet, nylon and porcelain, pink and yellow, 39x34mm-51x46mm flower, adjustable from 6-1/2 to 8-1/2 inches with macramé knot closure. Sold individually. 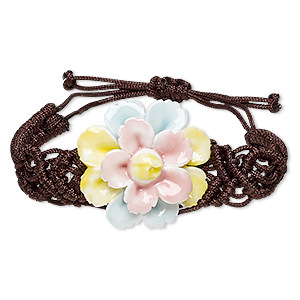 Bracelet, nylon and porcelain, multicolored, 42x34mm-54x46mm flower, adjustable from 6-9 inches with macramé knot closure. Sold individually. 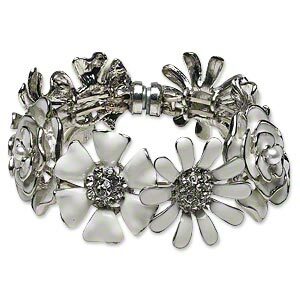 Bracelet, bangle, enamel / glass rhinestone / acrylic / silver-plated steel / pewter (tin-based alloy), white and clear, 31x31mm flower, 7-1/2 inches with magnetic clasp. Sold individually. 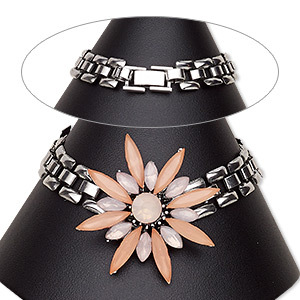 Bracelet, acrylic with antique silver-plated steel and "pewter" (zinc-based alloy), light pink and pink, 12mm wide with 40x40mm flower, 7-1/2 inches with fold-over clasp. Sold individually. 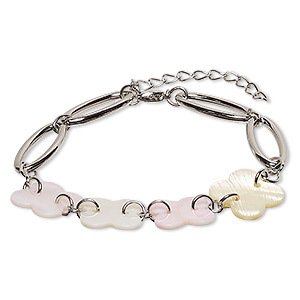 Bracelet, freshwater pearl shell (natural / bleached / dyed) / silver-coated plastic / silver-finished steel / "pewter" (zinc-based alloy), light pink / light yellow / light brown, 16mm wide with 16mm flower, 7 inches with 2-inch extender chain and lobster claw clasp. Sold individually. 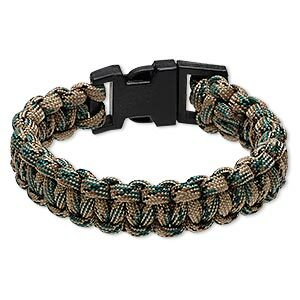 Bracelet, nylon paracord and plastic, green / brown / black, 18mm wide survival with camo design, 7 inches with buckle clasp. Sold individually. 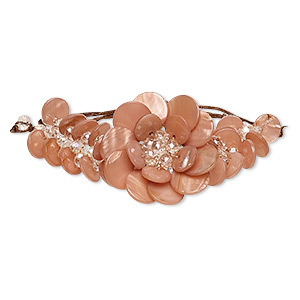 Bracelet, freshwater pearl shell (dyed) / felt / glass / waxed cotton cord, peach / brown / white, 45mm flower, adjustable from 6-1/2 to 8-1/2 inches with macramé knot closure. Sold individually. Bracelet, cuff, acrylic, dark brown and yellow, 29mm wide with tortoise design, 6-1/2 inches. Sold individually.